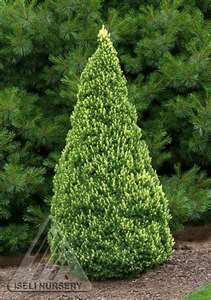 Rainbow's End Dwarf Alberta Spruce is a dwarf evergreen conifer with a dense pyramidal shape. The needles are a dark green which has a second flush of growth in the summer. The new growth is a butter-yellow color. It retains the dark green color through the winter. It will grow to a height of 4' and 2 to 2.5' wide in 10 years. Rainbow's End likes to be planted in full sun. Use this dwarf shrub in a rock garden, miniature garden, container, or as a specimen. It is a great choice for a Bonsai specimen. Rainbow's End Dwarf Alberta Spruce is also deer resistant. In real windy areas, protect this plant from winter wind burn by wrapping in burlap or covering.